The Kaman K-225 was an experimental helicopter developed by Kaman Aircraft. One was modified to become the world's first gas turbine powered helicopter. 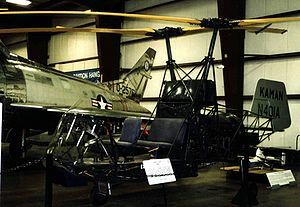 The K-125 was Charles Kaman's first helicopter, which utilized intermeshing rotors and Kaman's patented servo-flap stability control. The K-125 first flew on 15 January 1947. The K-190 and K-225 were an improved versions of the K-125, which first flew in April and July 1949 respectively. The U.S. Navy bought two and the Coast Guard one for $25,000 each. Later, they received the H-22 designation. A modified K-225 equipped with a Boeing 502 (YT50) engine became the world's first gas turbine powered helicopter in December 1951. This aircraft is now at the Smithsonian. "Hall of Fame/Inventor Profile: Charles Kaman". National Inventors Hall of Fame. http://www.invent.org/hall_of_fame/190.html. Retrieved 2009-01-27.